It happens all the time. You spent months with an architect designing an office that maximizes company productivity, presents a professional representation of your brand, and has a conference room big enough for Friday afternoon ping pong tournaments. Then, after all that work, you realize you’ve constructed an acoustic abomination where a single sneeze sends reverberating chills throughout each meticulously placed pseudo-cubicle. Like I said: it happens. Designers and office owners often don’t consider how an abundance of noise - or even lack thereof - might affect the everyday work experience. This goes for any building type, but especially for office rebuilds or renovations where the primary goal is efficiency and visual effectiveness. Acoustics are reserved to an afterthought - if they are a thought at all - and problems are rarely identified until the paint has dried and the ribbon is cut. If you’re working on an office design project, avoid the three common mistakes below. Appearance matters. Not only does the aesthetic design of your office space provide clients and new employees with a positive first impression, it can have a lasting effect on overall company morale. Working in beautiful, well-designed spaces inspires creativity, boosts productivity and improves company morale. There’s a reason no one wants to work in the basement of an old library and everyone wants to work at Facebook. However, don’t let the vision of a beautiful space blind you from how those undulating stainless steel ‘flow’ sculptures might alter how sound is bouncing around. The biggest trend in modern office design is to create an open plan that promotes collaboration and communication. It’s a great direction on paper, but a lack of acoustic awareness can lead to a noisy work environment that might make it hard for people to concentrate. In large, open workspaces, employees often resort to using headphones to create their own working sanctuary, which can hinder collaboration in a space that was initially created with collaboration in mind. The good news? 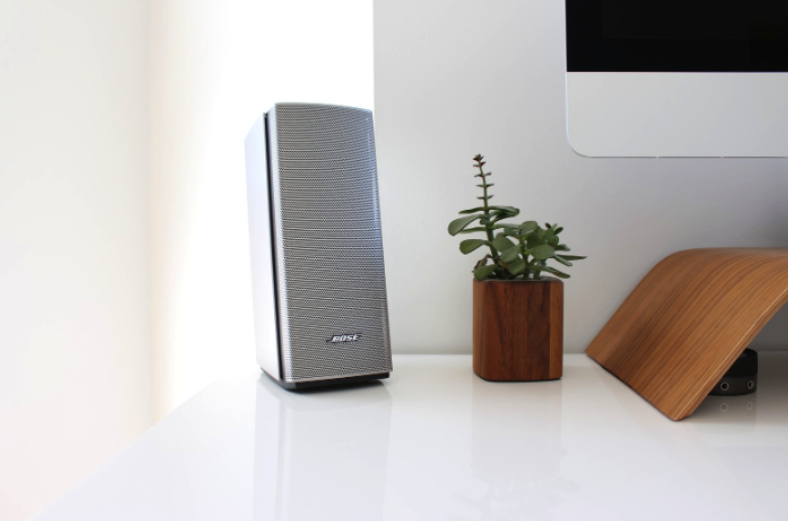 You don’t always have to sacrifice appearance when building an acoustically sound office space. Invest in proven finished materials that modulate excessive noise and make even the most rambunctious open offices comfortable to be productive in. Key improvements can be made by providing barriers between work areas. You can still keep an open office feel by using partitions or panels that provide enough coverage for privacy without completely isolating workers. 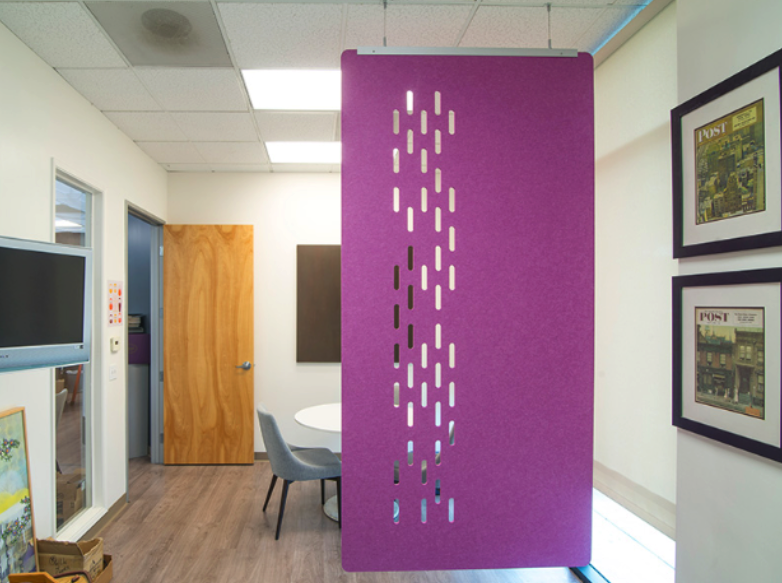 Kirei’s EchoScreen room dividers are a great modular solution in open spaces. Be sure to take a look at your ceilings, too! 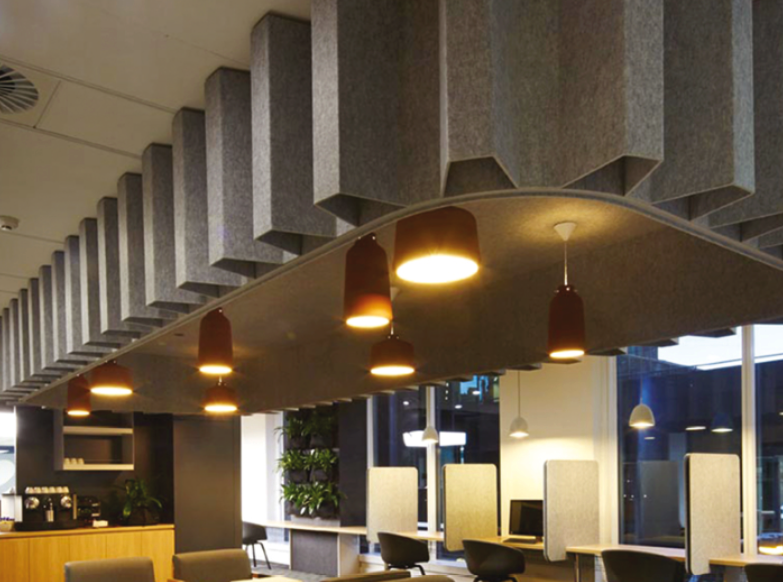 Implementing sound absorptive ceiling baffles, along with breaking up the direct path between work stations, will help to control acoustics in areas where you need it most. The Echopanel product line has several attractive options that work for you rather than against you. Keep in mind that a noise level around 10 decibels is optimal for interior comfort. Product specifications will provide technical information for the most efficient coverage of each panel system, so you can easily fine tune the design to fit your needs. Bonus Tip: For offices with unusually high ceilings, try dropping the ceiling in a few areas. 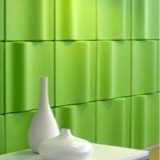 Not only does this help manage noise and echo, it can work to organize different volumes of interior space similarly to the effect of partitions mentioned above. People prefer to live and work in places that feel alive. 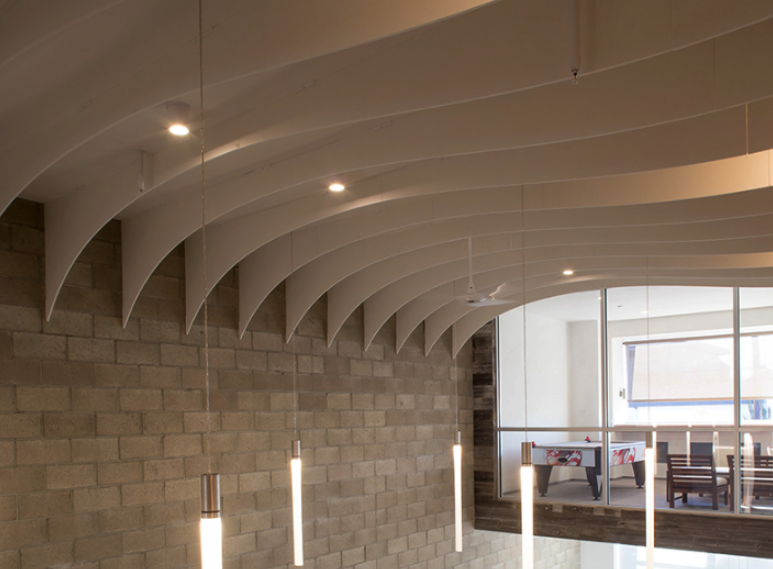 Over-use of acoustic materials in a space can create muffled, dead sounds that while they don’t echo, still sound unnatural and unnerving to building occupants. Additionally, such quiet spaces can leave employees or clients feeling a distinct lack of privacy, which is especially evident in open concept office designs. Plan your acoustic design strategy based on an understanding of which spaces need segregated silence, and which spaces need to sound busy. For instance, an open collaboration area should be handled differently than a closed presentation or meeting space. 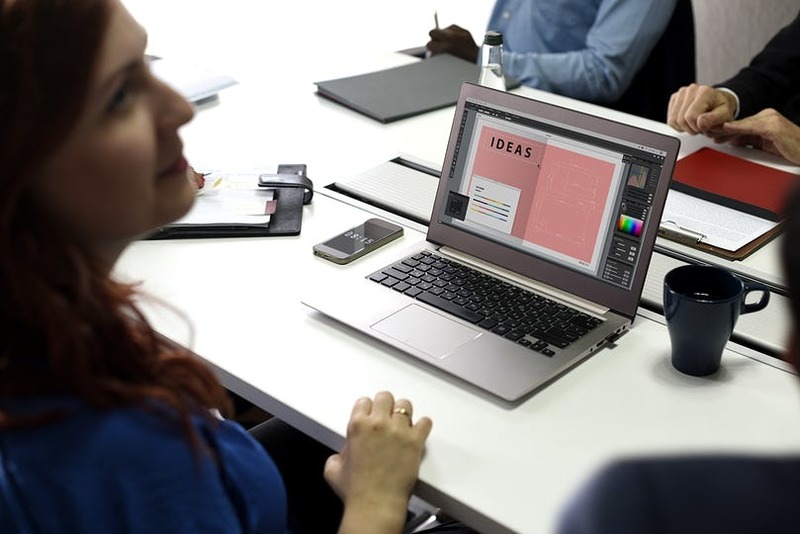 You might want some areas of your office to be zoned off, using sound-absorbing partitions for more private work stations, or use sound masking to help with those eerily quiet spaces. 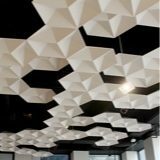 When you have this conceptual framework for the acoustic design, you’ll need to determine the appropriate noise level for the space, and will want to research solutions and materials. The standards for not only pinpointing the proper noise level - but how to best implement the design - vary widely based on function, room shape, and acoustic properties of the materials used. 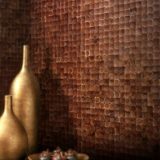 If you’re suffering from eery silence in a room, removing You might also consult an expert to help you fine tune the implementation of ceiling and wall tiles, or in-wall insulation. A certified consultant can help walk you through the more technical aspects of perfecting your acoustic design. Bonus Tip: A reasonable bit of white noise goes a long way to insulating the work experience from the incredible burden of complete silence. Also considering using an integrated speaker system for office-wide music playing. A bit of low background music can boost morale and prevent the office from becoming too sterile. Another pitfall of the open concept office arrangement is the lack of segregated work spaces where a small group of people can gather and meet. 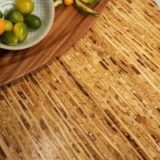 In most cases, a large table or two are haphazardly placed in some leftover space in the office that have little or no acoustic or visual separation from the primary desk areas. What you end up with is an unorganized amoeba of a floor plan that lacks the intentionality that might lead to better work and less audibly congested meetings. In most cases, the problem starts with forgetting to set up a hierarchy of spaces, their functions, and how they operate in conjunction with one another. It is the designer’s job to assess these issues from a wayfinding and workflow efficiency standpoint, but too often the way sound travels from space to space gets lost. It starts with assessing the kinds of activities that might take place away from a person’s or people’s work station. This can range anywhere from client meetings to brainstorming sessions to conference calls. Once you understand the use of the space, and how it slots into overall workflow, you can start figuring out ways to construct these sub-stations to best protect them from the hustle and bustle of the office proper. 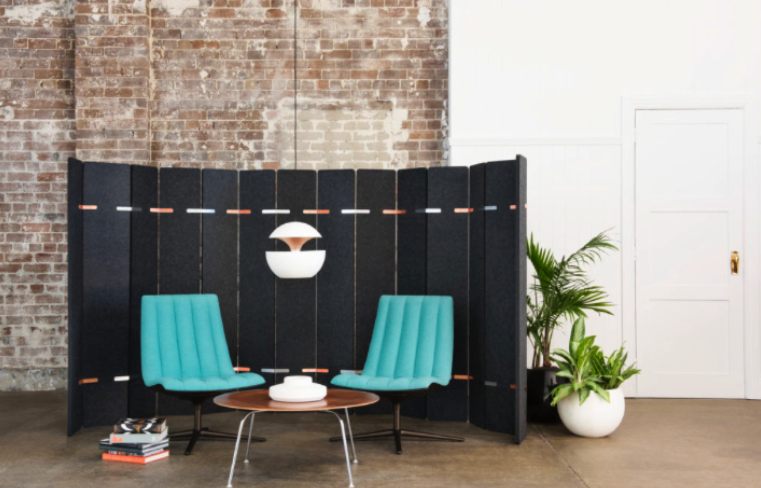 If you still want to maintain the flow of having an open concept office, you can design a system of movable wall panels that give you the flexibility to conjure up private gathering spaces on the fly. 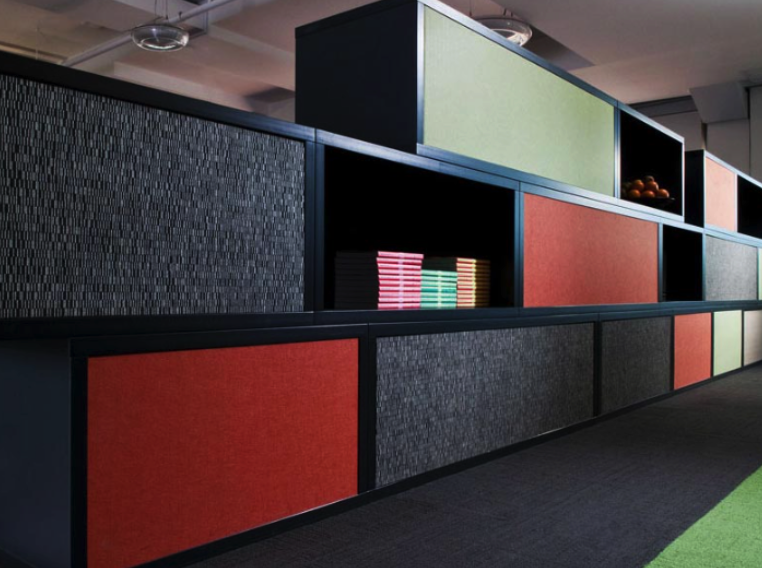 The Kirei Echopanel Wrap, Paling and Platoon partitions would be perfect for sectioning off space that is insulated from a majority of office noise, but not completely cut off from everything else. Bonus Tip: Invest in a few large storage units and put them on casters (big, sturdy wheels). They can be easily moved around to section off space, and be used as bookshelves, portfolio displays, or overflow storage. Ultimately, the best way to avoid these traps is to catch them before they become a problem. Think first about how your office wants to operate and design around a few core concepts. Once you’ve established some rules, you can test every decision against them, and iron out the kinks on the front end. This goes for new construction or the renovation of an existing space. If you’re having trouble addressing the acoustic strategy for your office space, consider hiring a specialist to help you out along the way. 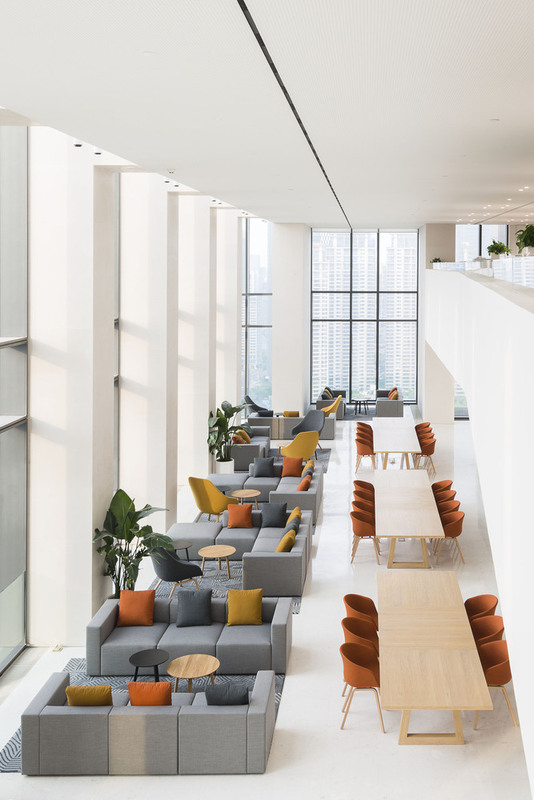 The better aligned the acoustic design is with the nature of your business, the more productive your workers will be and the more impressive your brand will become.